In terms of our local arts resources, I agree with her. There are a number of good local venues that can be reached by car; most of them in under an hour. So, what we want to do is briefly introduce you to these hidden treasures. Then you can take the time to explore them for yourselves. It took us a while to find all the treasures in our area. While they don’t always have work of the size and scale you might find in, say, MOMA or the National Gallery, the work in these local galleries more than holds it’s own in terms of craft, relevance and content. So, if you are planning to make a day of it, find a good local eatery and enjoy at your leisure. In future columns we’ll be talking about the work and the shows presented at these venues, but first we wanted to help you become familiar with them. We’ll also provide a little background and basically present an overview what’s available. At the end of this column you find a web address with links to the galleries. At the links you should find information on current and upcoming shows; along with operating hours. And their pages will also provide directions. In Statesville, we have the Iredell Museums. Located on Court Street in the heart of downtown; this building is part of the historical “Bristol Block”. The Iredell Museums is an umbrella organization which covers both the Iredell Museum and the Children’s Museum. They feature a good variety of contemporary arts and contemporary crafts, traveling shows and regional artists and artisans. In Mooresville, the Mooresville Artist Guild features local and regional artists, member shows and juried competitive shows. The Artist Guild is housed in the Old Mooresville Train Depot in downtown Mooresville. In the northern part of Iredell County is the Hiddenite Center; housed in a restored 3-story Victorian Lucas Mansion. They are part local history, part art and history gallery, with a featured doll gallery on the 3rd floor along with various art classes. To the west is the Hickory Museum of Art, which is part of the SALT block. Also featured in the SALT block is the Catawba Science Center and the Hickory Coral Society and the Western Piedmont Symphony and the Patrick Beaver Memorial Library. The Museum also has classes for children and adults. A bit further west and north is the Wilkes Art Gallery in North Wilkesboro. In 2004 they moved into the original North Wilkesboro Post Office, in the heart of downtown North Wilkesboro. They have a beautifully renovated space that houses regular exhibitions and a variety of classes. The city of Salisbury features the Waterworks Visual Art Center, housed in the renovated McCanless Motor Company showrooms. In 1999 Waterworks was accredited as a non-collecting museum by the American Association of Museums. It is one of only 14 nationally accredited museums in the state. Personally, we rank it as a world class museum. It is a beautiful facility and the shows are top notch. Davie County is home to Brock Performing Arts Center in Mocksville. In addition to an excellent performing arts center, the Brock Performing Arts Center features visual arts exhibitions by local and regional artists along with juried competitive shows. Mecklenburg County has a wide variety of arts venues. Our favorites are found in Davidson in Davidson College’s Van Every/Smith Galleries. In addition to exceptional exhibitions by well-established individual artists, in the Van Every Gallery, the Edward M. Smith Gallery features work from the students in the art department. The Mint Museums are focused individually on fine arts at the Randolph and fine crafts and design at the Uptown location. The Museum at Randolph was originally the first branch of the United States Mint and in it’s incarnation as a museum, the first museum in North Carolina. The exhibitions are noteworthy and their permanent collection houses some hidden gems of their own. The McColl Center was built in the renovated shell of the old ARP Church from the vision of Hugh McColl and the financing of Bank of America. In addition to exhibitions from cutting edge artists, the McColl Center established a series of artist’s residencies along with outreach and education. Walt McGervey has Masters of Fine Arts Degree in Sculpture. He has taught various classes in art history and fine arts classes at university and at regional visual arts centers. Karen Parker has a Masters of Fine Arts Degree in Painting. She works out of her studio and has instructed in painting, drawing and design classes at all levels for over 20 years. Michael Paul Smith has a set of older model cars. He decided, one day, to build sets and photograph them. He calls his place Elgin Park. It’s an imaginary steel mill town circa 1964. The photographs are stunning. And you can see how his history as a wallpaper hanger, illustrator, painter, museum display designer, advertising art director, architectural model builder, amateur historian and photographer, has given him the skills to create this work. This link goes to the NYT slide show. You say: Butterfly Wing Scale Digital Image Gallery. 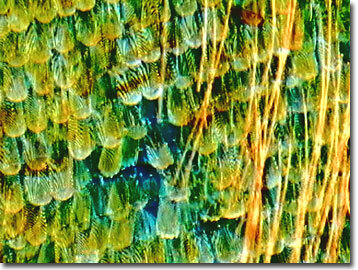 Molecular Expressions has a number of microscopic digital image galleries, including this one on Butterfly Wing Scales. These are thorough examinations of several dozen types of butterfly wing scales. The pages also include scientific information on the life cycles and feeding habits of said lovelies. And they offer a number of different views for each type of butterfly listed. My only complaint is: too much clicking to get to the good eye candy. So, for all the other impatient looky-loos, here’s a link to a Google Image Search with the same information. For those who like all the non-eye-candy scientific and technical stuff; say for instance,stuff like: “Cruiser Butterfly larvae feed on the leaves of the plants in the family Passifloraceae, which include passion vines and passion flowers.” I’d stick with the Molecular Expressions page.